You know the drill. The house is quiet and you’re crocheting right along. Drinking your coffee or wine, watching listening to your favorite Netflix show or to an audio book, whipping up that new project when all of the sudden you realize that you’ve lost count of your rows. 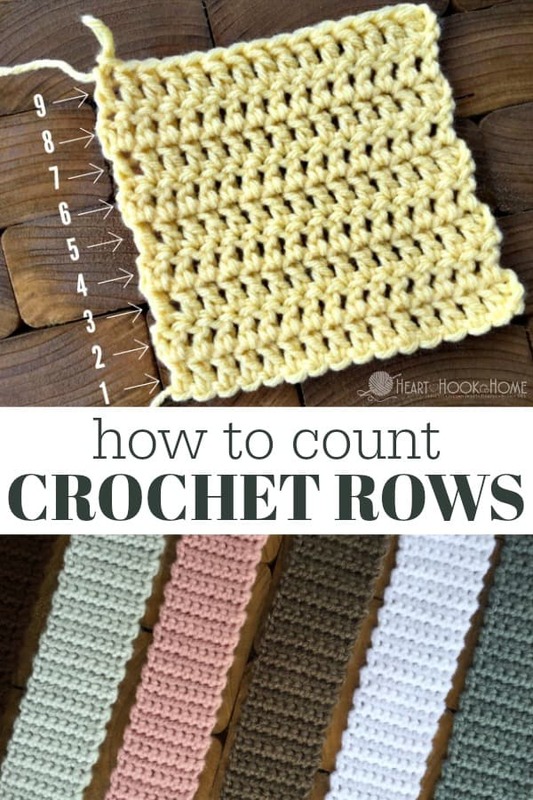 *waves fist in air* Counting rows in crochet does not have to be difficult. In fact I never keep track of my rows. 😮 Yikes, right? Does that make me a bad crocheter? 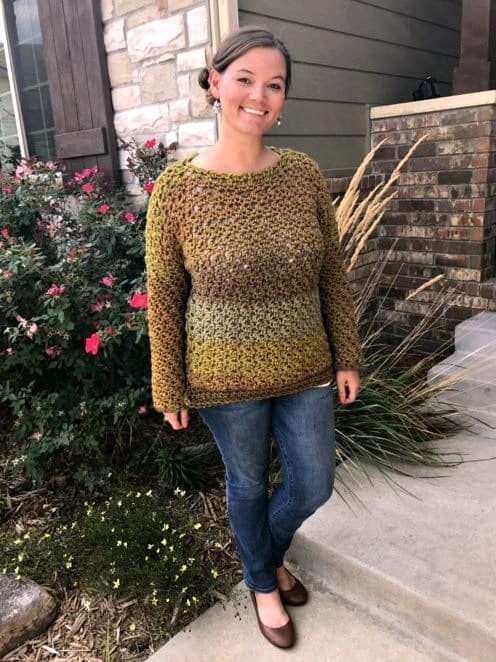 I don’t think so, because my favorite kind of crochet is mindless crochet and stopping often to keep track of rows is simply not conducive to such a thing. Good thing there are EASY methods we can use to go back later and count them! There are also counters that you can update as you go. Again, I find these to be cumbersome, but I do know that they work for other crocheters and knitters! You could also use the old fashioned pen and paper tally mark system – my favorite if absolutely necessary, and how I write the majority of my patterns! Regardless of the method used to keep track, the need for counting rows in crochet is inevitable. There are a few ways that we can tell which row we are on, and a way to narrow that down even further if you’re thinking you’ve got one of two possible numbers. 1. The larger the stitch the easier to count. 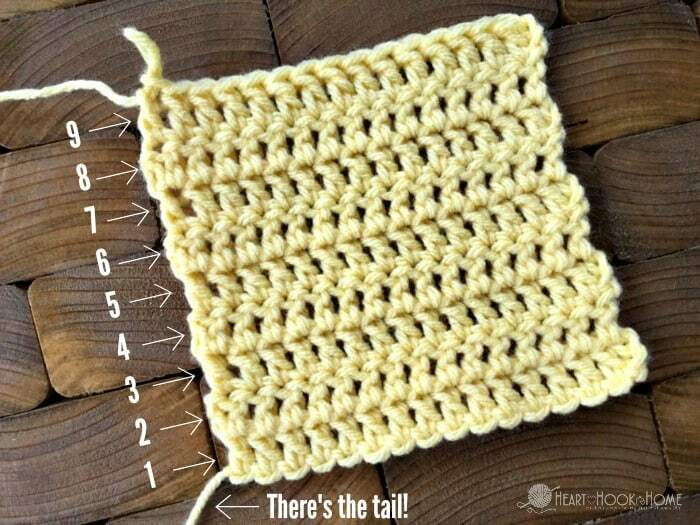 As the stitches get taller (starting with single crochet, half double crochet, double crochet, triple/treble crochet etc) each stitch/row is naturally taller and therefore more defined and easier to count. The methods to count the rows are the same, it just gets easier. 2. Start from the bottom. 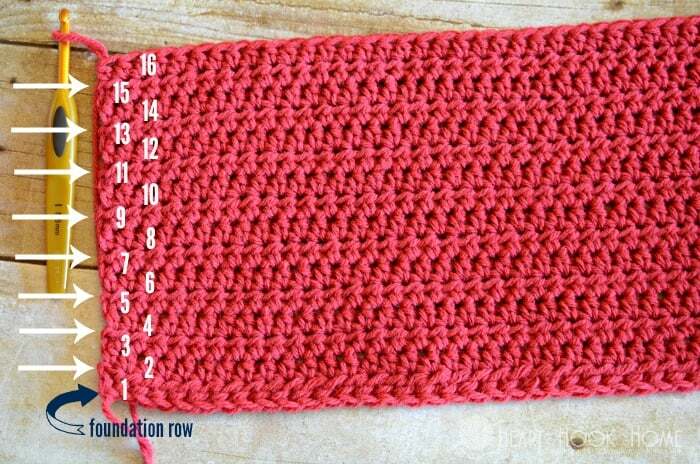 When counting rows in crochet it is easiest to start from the bottom and count up. Note that the beginning chain does NOT count as a row, the stitches that go into that beginning chain are the ones that count. 3. Look for the holes (or Vs). Every time you make a new stitch, you’re creating a little hole. For each new row you add, there will be a new row of holes. Count each horizontal line of holes as one row. Tip: it may be easier to see the line of holes if you hold a straight edge over them (such as another length of yarn stretched taut). 4. Look for the ridges. If you are crocheting in rows (turning at the end of each row) there will be ridges. Each ridge counts as two rows: one row worked to the left, and one row worked to the right. If your piece is worked in rounds (without turning at the end of each row such as in a beanie), the ridges will appear every single row. Count those ridges to see how many rows you’ve got. 5. Where is the tail? When you made the slip knot for your beginning chain you left a tail at the end. 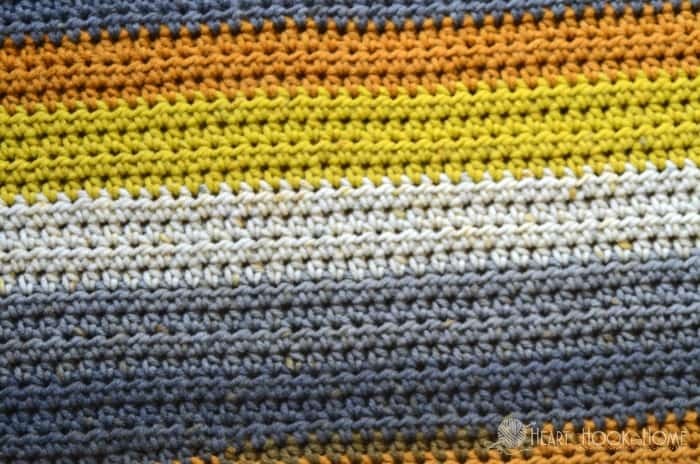 After crocheting back through that beginning chain you will have one row completed and the tail will be on your left (if you’re right handed). Use this knowledge to your advantage! If you’re stuck deciding whether you’re on row 27 or 28, for example, look for the tail. If the tail is on the left you’ve just finished an odd row and if the tail is on your right you’ve just completed an even numbered row. Unless, that is, you used a foundation row to start. Foundation rows are ones that create the entire first row right along with the beginning chain – AND I LOVE THEM. Here’s how to make the foundation single crochet or the foundation half double crochet. 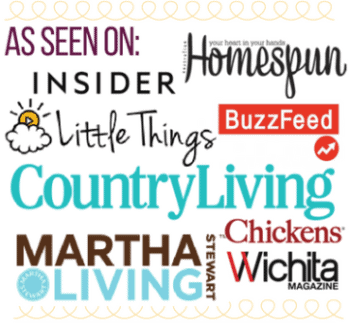 You’ll love them too, I promise. Just remember that if you use the foundation stitches your tail will be on the opposite side (to the left after finishing even rows). 6. Use a stitch marker. Okay, okay, so this isn’t really a tip on counting rows in crochet, but it sure helps when you’re in a crochet groove! Instead of counting from the beginning every single time, place a stitch marker every 10 rows or 25 rows etc. and count from there next time. 7. Stick to the side. If using a stitch set that is not traditional (such as the Moss stitch, the Lemon Peel stitch etc) I find it easiest to count my rows when looking at the outer most stitches. If you’re consistent in the direction you turn your work each row end will look the same. Use those ridges and holes to find a pattern in their placement. This makes counting those rows so much easier. What do you do to make counting rows in crochet quicker? Hi, This is a lovely food recipe, thank you for taking the time to write the article for the great write up. Asking questions are really nice thing if you are not understanding something entirely, however this post offers pleasant understanding even.